One of my weaknesses in life is Pizza. It's easy, quick, cheap and most of the time not good for you. We make healthy pizza's at home quite often. I am generally picky about pre-made crusts and when I do buy them, I always get thin crust. I was very excited to try out Rustic Crust Organic Pizza Crust. Upon receiving my package from Rustic Crust, I found two packages of pizza crust (one was a whole grain organic pizza crust, the other was original organic pizza crust) and a three pack of pizza sauce. 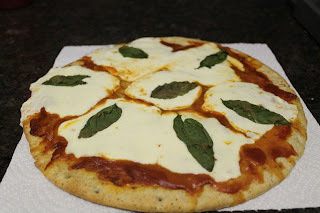 I instantly knew what I was going to make, my take on a margherita pizza. 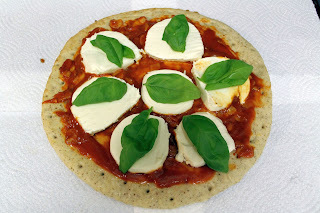 I don't like slices of tomatoes so I prefer to use a rich sauce and a ton of buffalo mozzarella and basil. Rustic Crust Organic Pizza Crust has instructions on the package of baking a pizza at 450 for 10-12 minutes. It was the perfect amount of time to melt the cheese and make the crust nice and crispy. The ending result was perfect although I did go a little overboard on the cheese. My boyfriend mentioned on multiple occasions how much he enjoyed the pizza and he was surprised to find out that it was a healthy pizza. 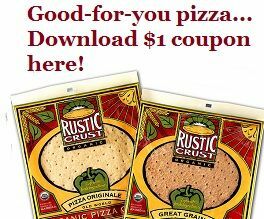 Click the photo below to get $1 off a Rustic Crust Organic Pizza Crust! This looks delish! I have never heard of Rustic Crust though, I'll have to see if my Publix carries it. I loves me a good margherita pizza! YUM! Pizza is my weakness too! truly enϳoyed browѕing уour ωеblog posts. In any caѕe I'll be subscribing to your feed and I'm hοping yοu write agаin very ѕoon! That is a gorgeous pizza!!!! Please invite me over (on one of my cheat days) next time you make this!!! Wow.